Bike lanes, paths and trails are on the increase everywhere, providing an attractive alternative to traffic congestion on roadways and to sometimes unreliable public transportation. Adult electric scooters, like the OjO® Commuter Scooter, can help riders reap some of the benefits of bike path use. The Oxnard, California-based OjO Electric engineers bike-lane friendly electric scooters for adults, providing commuters and students with scooters that deliver precise and smooth maneuvering while delivering enhanced speed and range. The OjO Commuter Scooter carries a rider up to 300 lbs. and is capable of speeds up to 20 mph, due to a 500-watt gear hub motor. With a range of up to 25 miles on a charge, this fast electric scooter compares favorably to E-bikes and electric mopeds for adults. Most OjO models will climb grades of up to 18 percent, making those uphill climbs as easy on the legs as coasting downhill and far less sweaty. A key fob (two provided) activates the scooter for use and keys are provided for the battery compartment. When the journey ends, the OjO can be locked with a common bicycle cable lock, but an onboard security system is included as well. The cost is easy, too, with models currently priced from $1,999 to $2,399. Seasonal discounts and sales incentives are sometimes offered on the OjO website. Financing is available with payments as low as $45. The purchase price, however, is only one of the OjO’s advantages. There’s no need for licensing or legal requirement for insurance and, thanks to the all-electric drive, no expense for fuel. A full recharge takes only six to eight hours, and the on-board, 110-volt charger works at work or school as easily as it does at home. An extra battery is available as an option to extend commute distance. Owners are always responsible for checking local regulations for bike path use and any licensing or insurance requirements, as requirements can change with jurisdictions. A removable seat provides the option of sitting or enjoying a comfortable scooter-style glide, standing on the treaded, non-slip riding deck. 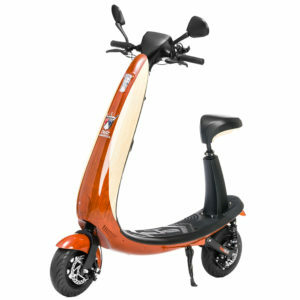 The ride is enhanced by the patented geometric design that incorporates a sturdy aluminum frame with a wing shape body. Heavy-duty shock absorbers and large all-weather tires help smooth the rough patches, and disc brakes on both front and rear wheels assure the rider of a smooth, sure stop. Rear view mirrors are standard on all models, adding an additional measure of safety. A roomy basket that provides up to 70 lbs. of storage for books, briefcases or other needs is an available option. Short commutes are a breeze on any OjO Commuter Scooter model. The non-glare interactive display screen provides speed mode options, mph, historical distance information and more. An optional phone holder keeps that resource safely at hand. There are even dual integrated Bluetooth® speakers to help complement the ride with some favorite tunes. No Bike Path Near Home? No Problem! The OjO is a perfect choice for shoppers who might be considering an electric scooter bike or moped for adults or a folding electric scooter or other alternative mode of transportation. At 65 lbs., transportation in a hatchback car or SUV is easy, providing an option for riders who don’t have access to a bike path for the entire trip. Commuters can also take advantage of free or less-expensive parking a few miles from the office, using the fast electric scooter for adults for the remainder of the trip. A faster commute, fresh air and reduced stress for far less than alternative transportation methods? The OjO Commuter Scooter can provide all these and more to the savvy commuter. It comes fully assembled and ready to ride and is available through Amazon in addition to the Ojoelectric.com website. Save money and skip the traffic jams and crowded and unreliable public transportation with the bike-lane friendly OjO Commuter Scooter. Cliff Abbott is a 35-year transportation industry veteran and journalist. He has hundreds of published articles to his credit, along with over a hundred musical compositions and one book.